I snagged myself 3 bargains in the Lindy Bop sale, and this is the last one I have to share. You can see the others here and here. 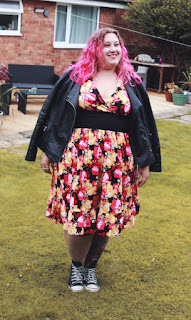 This was the dress I felt I took the biggest risk with, as halternecks are always an interesting fit, but I am really pleased with it! This is the 'Dominique', it has a black base and waist, with bright yellow, pink and red floral patterns. It has a frill on the lower hem which is a really sweet touch. The halterneck is nice and secured once tied, it didn't budge at all. It has a very light padding in the cups which meant I was safe without a bra. It isn't the most secure if you are larger busted, but I just about to got away with it. Though my Mum did insist on safety pinning the cross over section haha! 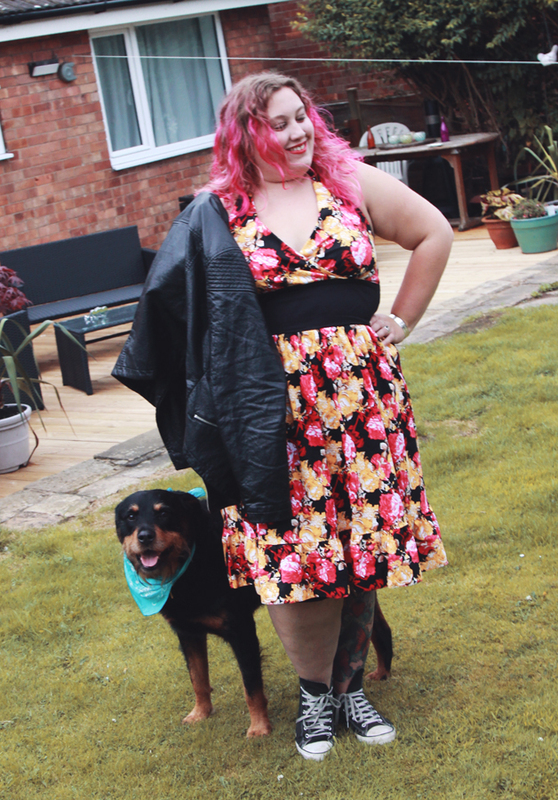 I couldn't resist pairing a girly dress with my trusty Matalan pleather jacket and black converses. I know, I know, I always style dresses the same way. But I'm still in love with this jacket and I wear it constantly. And obviously I had no objection to Ashen's smiley face posing with me! The shirring on the back of this dress means it's really comfy and the material is soft and lightweight. This is definitely going to be one of my go-to dresses for summer parties, and I hope they have it in more colour schemes and prints too. I've only just discovered Lindy Bop and I LOVE it. 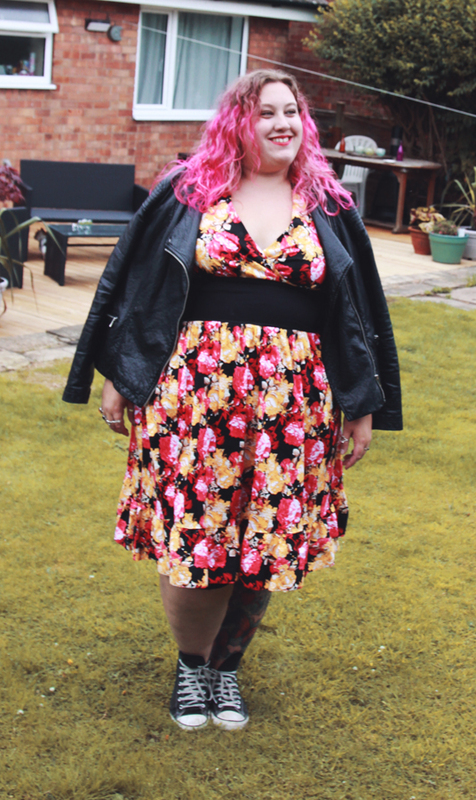 The cuts of all the dresses are so flattering to my curves, and I absolutely love the vintage style. The Dominique looks great on you, and the pattern is so perfect for summer! The Dominique dress is gorgeous and I love how you have paired it with a jacket. 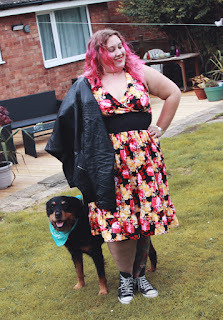 I'm nominated for 2 British Plus Size Awards! A Morris-Wood Wedding : Wedding Photos Galore!